Baseball in Wartime recommends you order your copy now! Are you looking for information on a former or current Minor League baseball player? 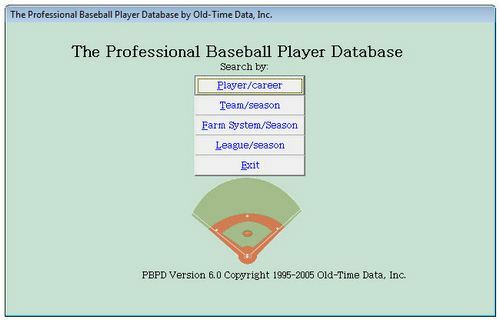 OLD-TIME DATA, Inc. can research any professional player from 1920 to 2007. The fee is $6.00 for an individual player. Quantity discounts are available for requests for ten or more players. 2. Via Paypal. Contact OLD-TIME DATA at baseballdata@kc.rr.com to determine availability of records for a specific player. Once confirmation has been received, click on the Paypal logo below to place your order. Copyright © 1995-2008 Old Time Data, Inc. These clever pieces of software contain year-by-year records for major and minor league players. Every player who is listed in the Official Baseball Guides for those seasons is included, and many who were omitted from the Guides because of limited playing time have been researched and added to the database. The Professional Baseball Player Database (1922 to 2004) includes batting (BA, HR, RBI) and pitching (W-L, ERA) statistics for each player as listed in the Guides or other sources. It enables users to search and sort information in a variety of ways. Players may be listed alphabetically, ranked by statistical categories, or sorted by career, team, or league. 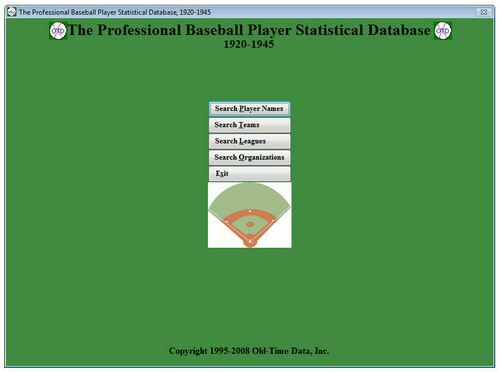 The Professional Baseball Statistical Database (1920 to 1945) is similar to the Player Database but is limited to the years 1920 to 1945 and includes in-depth statistics for batting (G, AB, R, H, 2B, 3B, HR, RBI, BA, OBP, SLG, OPS, SO, BB, SB, CS, HBP, SH, SF and Positions played) and pitching (G, GS, CG, W, L, PCT, SV, ERA, IP, H, R, ER, SO, BB, ShO, HB, WP, HR, WHIP).